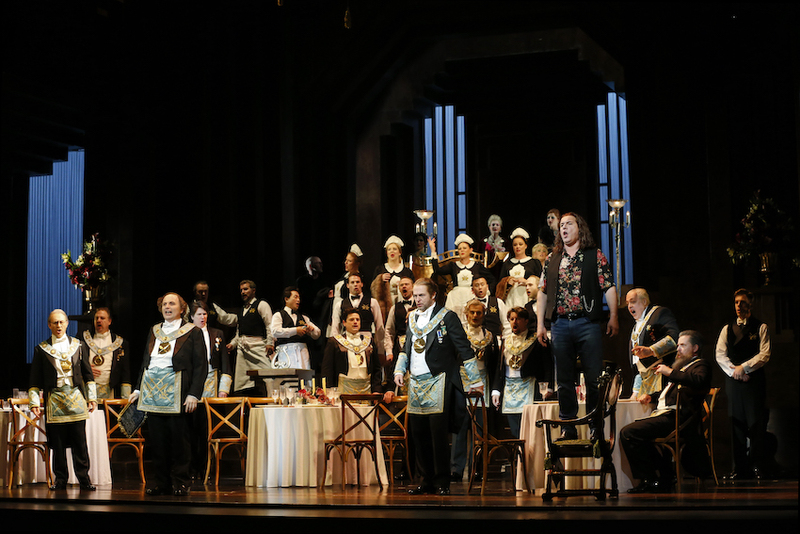 The sterling result of the determined and loving labours of countless talents, Opera Australia’s Melbourne presentation of Die Meistersinger von Nürnberg is a shimmering musical and visual treat, with added interest coming from some intriguing directorial choices. The season is conducted by maestro Pietari Inkinen, a proven Wagnerian from the Melbourne Ring Cycle (2013 and 2016), with just a couple of international singers heading a predominantly Australian cast. A co-production between Opera Australia, Royal Opera House Covent Garden and National Centre for the Performing Arts, Beijing, the handsome production comes to Melbourne after premiering in London in March last year. 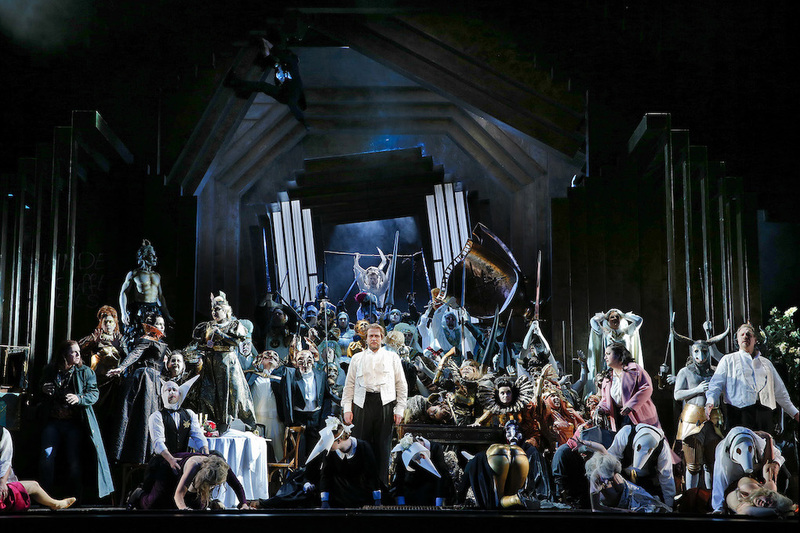 The opera has the sense of a real occasion, presented with a total running time of just over six hours, including a 25 minute interval after act one, and a dinner break of 70 minutes after act two. A contemplative reflection on music itself, Wagner’s Die Meistersinger von Nürnberg merges the traditional storylines of boy meets girl and the quest in an amusingly unique setting that is a world unto itself. Walther von Stolzing arrives in Nürnberg and falls in love with Eva, whose father has offered her hand in marriage as prize for a song contest. Wishing to become a Mastersinger and win Eva’s hand, Walther is supported by noble cobbler Hans Sachs and opposed by cantankerous fellow suitor Sixtus Beckmesser. With the State Theatre orchestra pit in its enlarged arrangement, Inkinen conducts a mighty contingent of Orchestra Victoria. At times called upon to do the work of two or three conductors, Inkinen manages the voluminous score with calm precision, giving Wagner’s richly detailed score as fine and smooth a rendition as one could hope to hear. Dan Dooner recreates Kaspar Holten’s original direction, working with a characterful set of singers to create memorable, distinctive performances that readily hold their own alongside the spectacular aspects of the design. In the absence of a Director’s Note in the program, Holten’s bold concept for the opera gradually becomes clear across the evening. Walther’s appearance in jeans and floral shirt places the action in present day, the Meistersingers carrying out their rituals in some sort of dark, windowless club. Set designer Mia Stensgaard has crafted an incredible Escher-like setting, with rich wood paneling running in all directions. The set is wonderfully reflective for singing voices, and its tiered arrangement allows for easy display of large numbers of cast members. Lighting designer Signe Fabricius makes full use of the textured backdrop to create patterns of rippling light and dark. Beyond Walther’s appearance, costume designer Anja Vang Kragh provides further clues that the work is set in present day. Sachs’ apprentice David arrives for act three in hoodie and trainers, bringing take-away coffee for his master. Patrons for the climactic singing contest arrive in modern evening wear to watch the Meistersingers parade in traditional garb. Having gradually transformed into a polished club in act one, the large set stays in place for act two, requiring a touch of imagination to visualise the range of scenes that unfold. This concession is paid back exponentially at the climax of act two, when the eruption of bacchanalia is accompanied by two segments of the set vertically rotating in opposite directions. The spellbinding vortex effect really has to be seen to be fully appreciated. With the cast frozen in a nightmarish tableau, the entire set starts to rotate at stage level before vanishing in an inky blackout. Kragh’s work in outfitting the wildly attired revellers is a highpoint of the costume design, with more visual details than can be absorbed in one viewing. 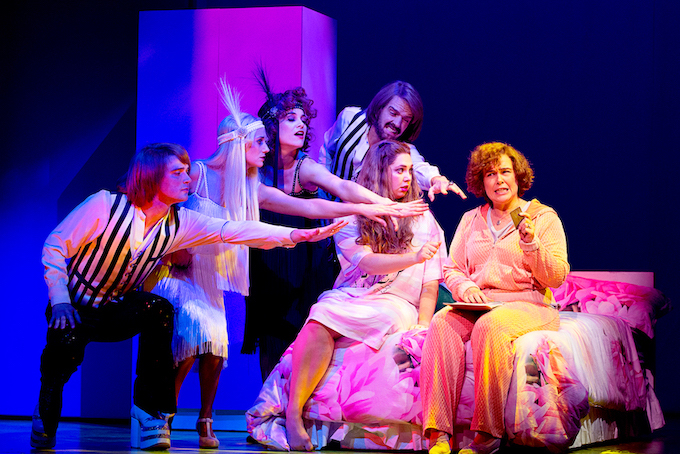 For the climactic final scene, almost another act in its own right, the set faces front and assembled guests view the singing contest. Magdalene, reimagined as Eva’s PA rather than her nurse, and chief apprentice David don headsets to run proceedings from side stage. Given the present day setting, Holten has one more trick in store, providing an ending that turns centuries of operatic and fairy tale story telling on its head (no spoilers here). Well experienced in the key role of Hans Sachs, fellow German guest artist Michael Kupfer-Radecky makes a strong impression as the humble cobbler who sets aside his own attraction to Eva to aid Walther in his pursuit. Kupfer-Radecky possesses a rich, unwavering baritone voice, and his affecting vocals are delivered with seemingly effortless power. As Sachs sings of art in “Was duftet doch der Flieder” (the Fliedermonolog), Kupfer-Radecky gently underplays the role, drawing the audience towards him as he sings with finely articulated tenderness. 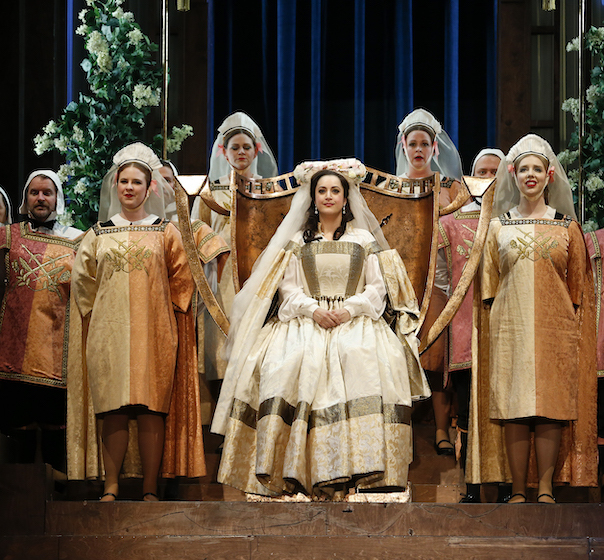 Soprano Natalie Aroyan shines as dear Eva, despite the somewhat underwritten nature of the role. Maintaining a serene presence, Aroyan exhibits a voluptuous, well controlled soprano that leaves the audience wanting more. Acclaimed baritone Warwick Fyfe has the role of his career in vexatious misanthrope Sixtus Beckmesser. Having stymied Walther’s attempt at being a mastersinger in act one, Sixtus returns to woo Eva for himself in act two. 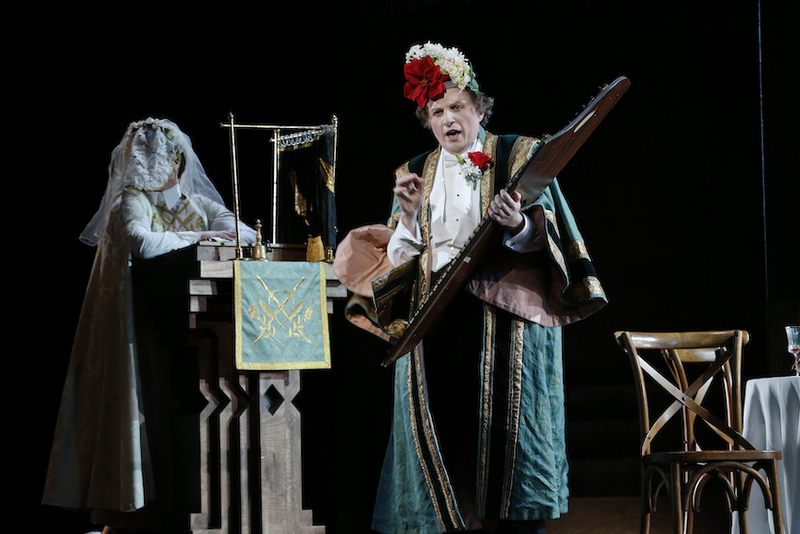 Gussied up in a jade robe and floral headpiece, Sixtus looks for all the world like a pantomime dame, and endures endless interruption from Sachs before finally breaking into his song. Along with well-judged moments of buffoonery, the comedy is all the more effective for Fyfe’s completely serious focus, and his singing, particularly when Sixtus is actually performing, is nothing short of glorious. The most exciting discovery of the evening is young tenor Nicholas Jones, who makes a massive leap from minor supporting roles to the high profile role of ardent young apprentice David. Jones has a pure, sweet tenor voice, and his dynamic acting skills are supported by his charismatic stage presence. Future appearances from Jones are highly anticipated. Valued mezzo-soprano Dominica Matthews brings calm authority to Magdalene, singing the role with highly capable flair. Commanding bass Daniel Sumegi brings his expressive sonorous tone to goldsmith Veit Pogner, lovingly protective father of Eva. The supporting cast is an embarrassment of riches, including Kanen Breen, John Longmuir, Michael Honeyman to name but a few. 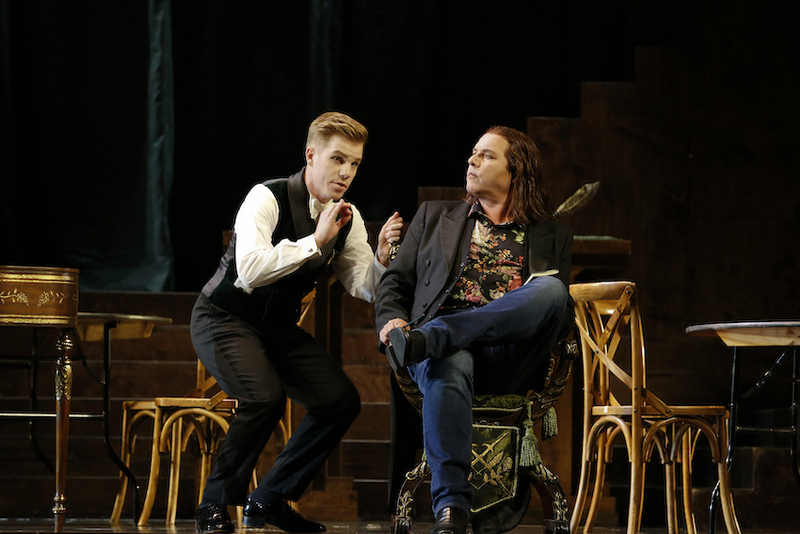 Of this group, baritone Luke Gabbedy stands out in the featured role of baker Fritz Kothner, singing with warmth and assured confidence when Kothner explains the mastersingers’ rules. Chorus master Anthony Hunt’s preparation of the Opera Australia Chorus is absolutely first rate, and the massed singing is an attraction in its own right. In one of Holten’s “meta” touches, Hunt also gets to appear on stage, conducting the Meistersingers in the opening scene. As fate would have it, this production of Die Meistersinger von Nürnberg is a surprisingly well-matched companion piece to Opera Australia’s Melbourne Ring Cycle. 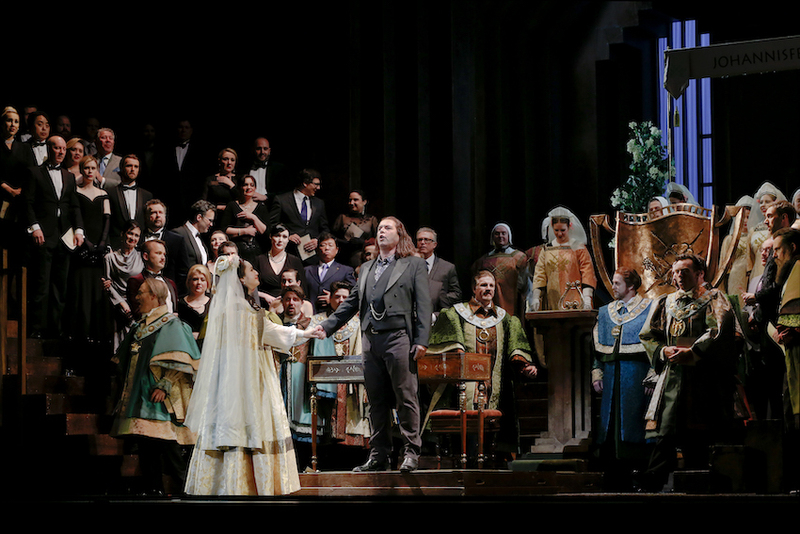 With their appetites whetted by the range of Wagner operas seen over the past few years, Melbourne audiences should not miss this world class presentation of Die Meistersinger von Nürnberg. Die Meistersinger von Nürnberg plays select dates at State Theatre, Arts Centre Melbourne until 22 November 2018. Thanks for the great review, Simon. Can’t wait to see it this Saturday. You’re very welcome, Danny. It’s quite the experience. Hope you enjoy every hour! I thought this production was marvellous and made a lot of sense. I enjoyed the way that the meaning only became clear upon watching the full production- plenty to think about as it all unfolded. I agree with a lot of this review, but feel that there was a serious weak link. This was Hans Sachs. Granted, he had a beautifully modulated voice, but it was far too small for this role in the State Theatre. Act 3 flagged in the first half of it because of his lack of stage and vocal presence. Although just a cobbler, Sachs should come across as a commanding figure and this just did not happen. 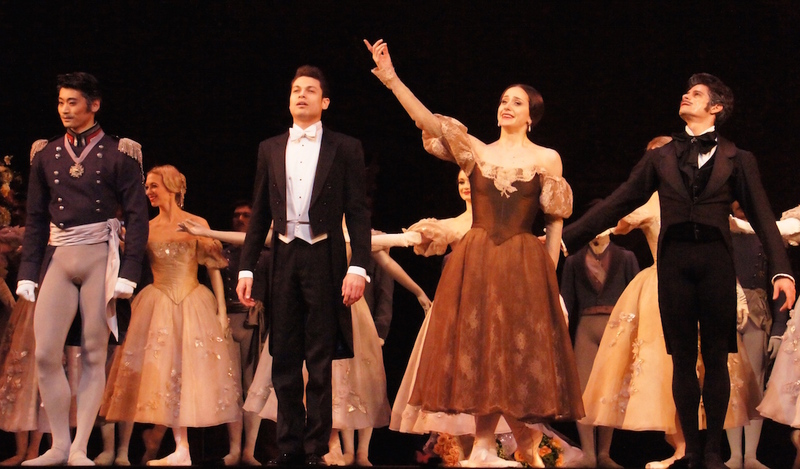 By comparison with all other lead roles, Sachs was lacking in power and the conductor worked hard to make sure he was not overpowered by the orchestra. This was a wonderful performance. Thanks for your comments Simon, which are always spot on! A grand performance by a wonderful operatic team. Looking forward to more Wagner in Melbourne from Opera Australia. Yes, definitely hoping Opera Australia uses the large configuration of the State Theatre orchestra pit for more Wagner, especially with artists of this caliber! I am so glad my Wagnerian neighbour and I made a last-minute decision to get tickets for the final performance. Like you, Simon, I can’t wait to hear more from young Mr Jones. Warwick Fyfe was an gloriously malicious, pernickety Beckmesser. The quintet was, for me, the most exquisite music of the evening. 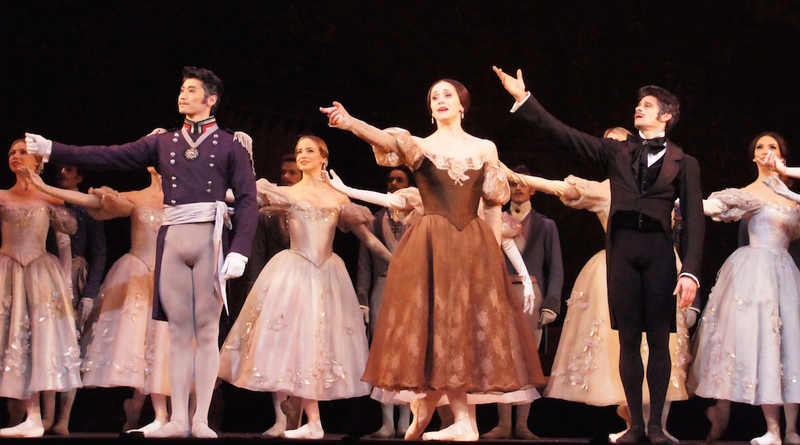 In sum, a magnificent production that I will remember for the rest of my life. So glad you had the chance to be there, Fiona. It was a real coup for Melbourne to host this magnificent production. There is nothing like the magic that happens when all aspects come together like this, especially incredible singers. We can only hope we are treated to another event like this in the future. I am told this was Hitler’s favourite and it’s not hard to see why. I found the German nationalism very disturbing and couldn’t help thinking of the rallies in Nuremberg. The props very similar. Pat, that’s something I have struggled with for all of my life. However, Wagner died half a century before Hitler became Chancellor. Is it fair to blame Wagner for Hitler’s and the Nazis’ take on him? The messages I took from this production were that humanity hungers for art – in this case as expressed in poetry and music, and that humanity is made better through art. I realise this is not a very good answer, but it’s the best I can manage.